Wightscape can help you with any project in the garden. If your stuggling for ideas why not give us a call, it's what we are passionate about. We are fully equipped with all the specialist tooling. We have our own JCB 8016 digger and carry out all our own groudworks and waste away. After meeting with our potential customer we discussed the needs and requirements of the garden. A design and quotation soon followed giving an idea of shapes and scales of the area which was accepted. We begin all jobs with the required groundworks during which we try to minimise mess by clearing all waste in one go. A micro digger was used to due to the tight access (83cm). The next stage is to install foundation layers for paving and retaining sleepers. We then installed the Hazel Hurdle fencing, this was chosen to tie the garden back into the stunning countryside view behind. From here the Tegula cobble path was layed and then the solid Oak edging was concreted in, we shape each one by hand. A raised vegetable growing area was incorporated into the design which we constructed from Oak planks and pressure treated framework. All fixing whole when Oak plugged to give that clean seamless finish we love! 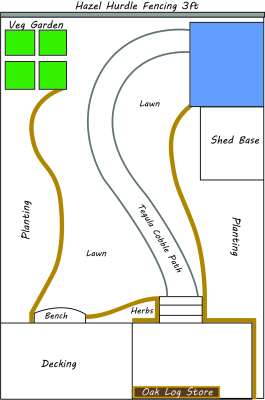 We had agreed to plant the garden to a medium level allowing more plants to be added throughout the upcoming seasons. Topsoil was added and planting followed by a decent layer of wood chippings to dress. Hillcroft Turf are our chosen suppliers for Turf, a long days work and it was installed to give that instant striped lawn. A few extra additions consisting of a new custom built gate, Oak compost bin, trellis work and a new screened area for the chickens completed this project.
" Wightscape have just completed an absolutely superb transformation of our front and back gardens, it would have taken us years to achieve what they have managed in a few weeks! Tom produced a great initial design and had an extremely positive attitude towards making changes as the project went on. Tom and Nick are obsessive about getting the small details right, the end result speaks for itself. I made the right choice in engaging Wightscape to deliver this project and recommend them without hesitation. Thanks Tom and Nick!​​ "